I began to view America as my home at a young age, because I was too young to remember much about my life in Mexico. America is all I know. I have lived here since I was seven years old, and it is here in America where my major life experiences have occurred. My parents currently have full time jobs. They grew up in different parts of Mexico, and neither of them were able to complete much schooling — my father didn’t finish 6th grade and my mother didn’t graduate from elementary school. Despite this, they have worked so hard to provide for me, and my siblings all of the opportunities to receive and education. Now, I am the first person in my immediate family to attend college. During my freshman year in high school, I realized what being undocumented really meant, and I became worried. I worried about my parents’ safety and what could happen if they were suddenly deported. I also began worrying about my future. I knew that my parents came to this country for a better life for me and my siblings but I didn’t know if it was possible without documents. At high school in Beloit, Wisconsin, I was a very good student. I took classes that people normally took in later years and I excelled at them. I graduated with a 3.89 GPA and 29 college credits while playing soccer. But I sometimes didn’t know if trying hard in high school was worth it because of the uncertainty with my future. Then DACA was all over the news and I researched it and realized that I could maybe go to college, so it gave me the incentive try hard. But I still wasn’t sure if would be able to attend college, because I didn’t qualify for many scholarships, even after I gained DACA status. Luckily, my dad found an article about TheDream.US and I applied to the Opportunity Scholarship program. My college experience has been great so far. When I am not in class during the day, I work at the admissions office as a tour guide and as an office worker. I’m usually a quiet person when I first meet people, so giving tours has helped me build confidence. During the afternoons when I am not doing homework, I love to play sports. I am lucky to know a group of people who like soccer and basketball as much as I do and I play on an intramural soccer team with friends. During my freshman year at Eastern Connecticut State University, I participated in an after-school program for elementary students where me and other students went and helped with homework as well as doing other activities with them. I never had someone like this when I was younger and I think it really helps. I plan to continue volunteering in college years. I also want to volunteer around Willimantic and Beloit when I return home during summer breaks, so I can give back to the community I was raised in. After graduation, I plan to help students with a lot of barriers to get a higher education, even if it’s a two-year school. Higher education is very important because it opens doors for us. 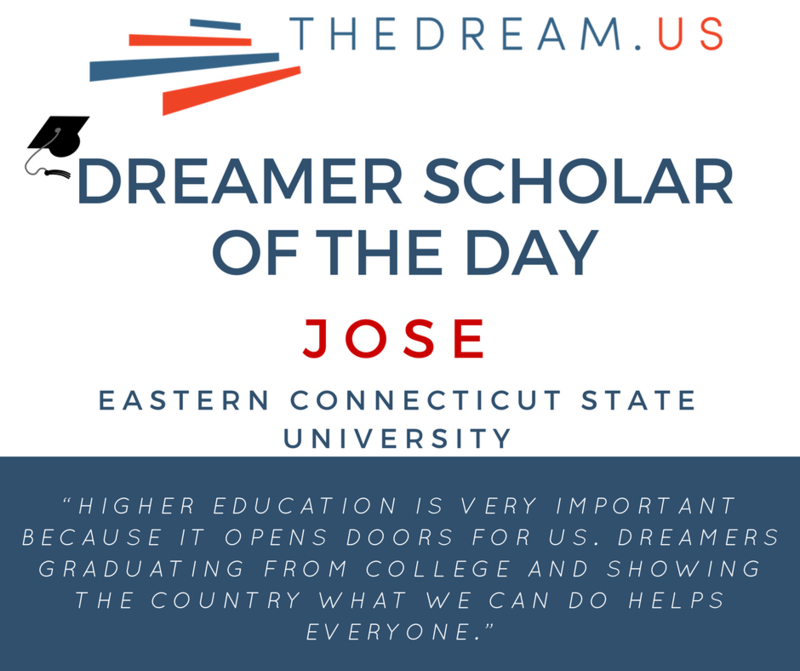 DREAMers graduating from college and showing the country what we can do helps everyone. Eventually, I want to graduate with my degree in computer science and work for a start-up technology company, while helping other people that have a lot of obstacles, whether it is with education or financial stability.